How to watch Blu-ray movies on Galaxy Tab Pro? "Hi, everybody. Can I transfer Blu-ray to my Galaxy Tab Pro 10.1? And what's the video format is the best one for Galaxy Tab Pro tablet? I really want to play my Blu-ray disc (Homefront, Hobbit 2, Iron Man 5, The Man of Steel, The Dark World......) on The 10.1 tablet. The tech giant that is Samsung launched new Galaxy Tab Pro tablets at this year's technology show, three of which are under the new Galaxy Tab Pro name. Including 10.1, 8.4 and 12.2 versions. The Galaxy Tab Pro has an impressive WQXGA resolution so that's 2560 x 1600 on a 10in display which results in a pixel density of 299ppi. So, if you plan to get one HD device to play 720P, 1080P and 2K movies, Galaxy Tab Pro tablet is your best choice. Want to watch your favorite Blu-ray movies on Galaxy Tab Pro with its high resolution? Look for an easy way to stream Blu-ray to Galaxy Tab Pro for playing on the go? The following guide will mainly show you an easy way to convert your Blu-ray movies to Galaxy Tab Pro (8.4, 10.1, 12.2) best video format for full playback using a powerful Blu-ray to Galaxy Tab Pro Converter. Galaxy Tab Pro Video Format. You can go to the guide on which format is best one for Galaxy Tab Pro for further help. 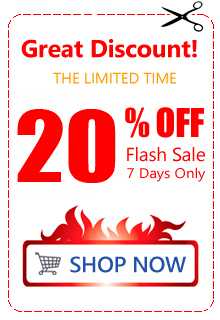 For converting Blu-ray to Galaxy Tab Pro, Acrok Video Converter Ultimate is hight recommended. 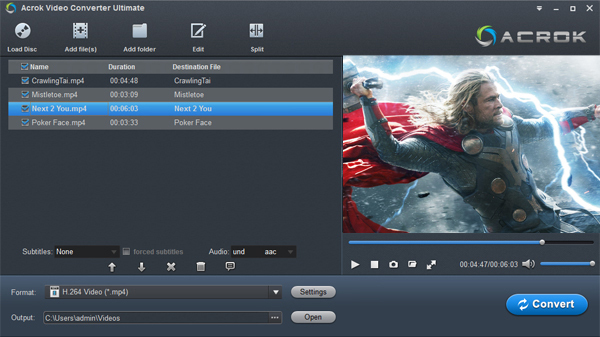 This software can help you convert Blu-ray, DVD, MKV, MOV, AVI, etc. movies for Galaxy Tab Pro 10.1, 8.4 and 12.2 on Windows/Mac. You can free download this best Blu-ray ripping software for Galaxy Tab Pro here. How to convert Blu-ray to Galaxy Tab Pro? 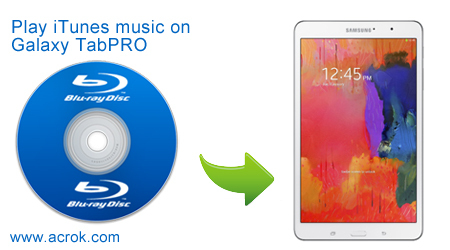 Tip: The ways to convert Blu-ray to Galaxy Tab Pro on Mac and Windows (Windows 8.1 included) are the same. This below guide uses the Windows version screenshots. Just make sure you download the right version. Open the Galaxy Tab Pro Blu-ray ripper and click on the upper "Load Disc" button to browse and import the Blu-ray movies from Blu-ray drive. All added files will be listed on the left source area. You can preview the Blu-ray movies on the right viewing window and take snapshots of your favorite movie scenes. If you backed up some Blu-ray movies in your computer, you can import Blu-ray ISO/IFO and folder into this proglam. Click on "Format" drop-down list to quickly select Galaxy Tab Video H.264 or Android 720P/1080P Video (*.mp4) as the output format. You can also click on "Subtitle" or "Audio" to choose the subtitle or audio track language you like when playing on Galaxy Tab Pro tablet. Tip: Yu can click "Settings" to edit output parameters like resolution, frame rate, encoder, etc. as you like. 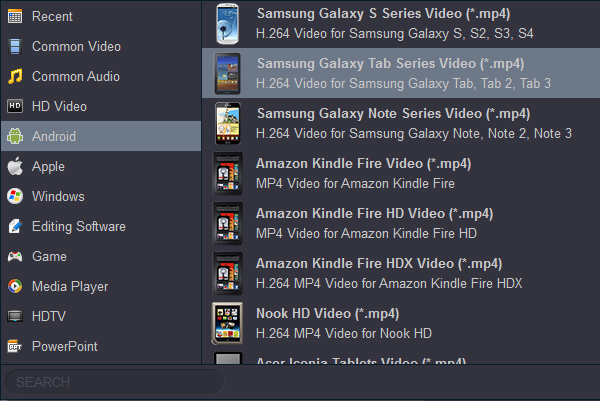 When everything is done, click the "Convert" button to start converting Blu-ray to Galaxy Tab Pro MP4 videos. After the conversion finishes, you can get Galaxy Tab Pro supported MP4 videos in the output folder. When the Blu-ray to Galaxy Tab Pro MP4 conversion is done, connect your Galaxy Tab Pro 8.4, 10.1 and 12.2 to computer and transfer the converted Blu-ray videos to it for playback on the go. My family enjoys movie night now so much more than before. Now I can convert Blu-ray, DVD, and downloaded movies to the right format to fit our Samsung Smart TV.